This place offers a little of everything. Space, updated new technology and equipment, amenities, access from everywhere in the country. And this seems like just the tip of it. The whole facility is awe inspiring as to the size and what has already been achieved. I really hope the Nationals moves to Cardinal. Moving the venue is the only way I will make the 24+ hour/1650+ mile drive. Sorry for wanting something better than ankle deep mud and failing targets, in between tornado warnings and boats in the impact zone for my $300 entry fee and more than week of vacation. The $300 is just a drop in the bucket of the total cost. Cardinal has been endorsed by "Mr. Camp Perry", Brain Zins. It is time to start a new legacy and tradition for the National Pistol Matches. Lodging for Cardinal would be somewhat of a hassle but I wouldn't mind shooting there. The new huts at Perry are nice, inexpensive and air conditioned. Bathroom/shower facilities are adequate as well. If Cardinal had camping sites with water/electric hookup and a dumping station, I could deal with that, but not everybody has a camper. KB2MBC wrote: Lodging for Cardinal would be somewhat of a hassle but I wouldn't mind shooting there. Is the Cardinal Center Public or Privately owned? I did not see any bays for Bunker Trap. I shot a match there on temporary targets and the facility is awe inspiring. The vendor area is fantastic, when I was there they were doing some sort of shotgun event with I believe over 1K entrants. The potential is off the chart. Here is a dated video from 2014, all the pistol and small bore ranges have been added since then PLUS a ton of other improvements too like expanded the vendor area even more. To add to the cabins they bring in travel trailers that can be rented. There are 100's of RV camp sites. They need to do a more current fly over drone video. I am excited to go. I just did a count on their map and there are about 200 RV sites with electric, water and sewer (50 are pull through) plus another 175 RV sites with water and electric, and 25 primitive sites. I don't believe that they have any plans for "bunker trap" fields which are very expensive to build and maintain. Each field would require five shooting stations with three traps each set at different angles horizontally and vertically. There are very few such facilities left in the USA since very few people shoot this international version of trap shooting. OldShooter43 wrote: I don't believe that they have any plans for "bunker trap" fields which are very expensive to build and maintain. 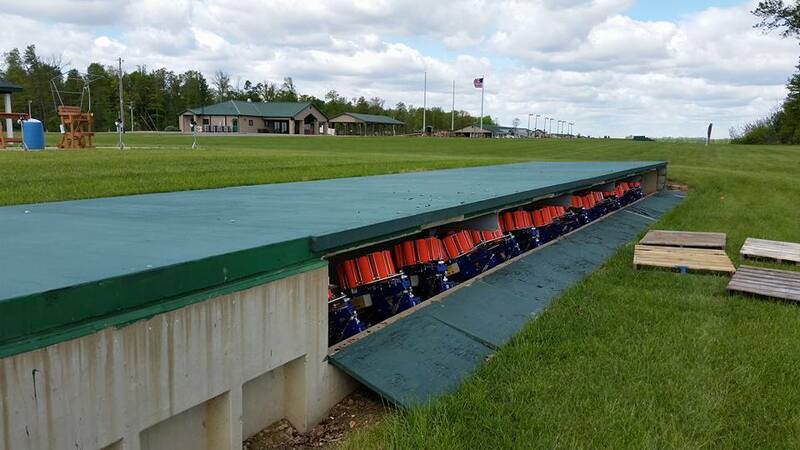 Each field would require five shooting stations with three traps each set at different angles horizontally and vertically. There are very few such facilities left in the USA since very few people shoot this international version of trap shooting. Picture from the Cardinal Facebook page, plus it's listed on the 2018 STCP & SASP Championship bulletin. I happily stand corrected. I wonder why I couldn't find this info on their website. I don't use Facebook but I'll certainly look up the info on the bulletin. I was at the match on the 29th. Cardinal does have the makings of an impressive facility, but right now they are a couple hundred firing points short of being able to host an event like the National Matches. 2020, maybe?